Comments: Mention Bill Elliot to any NASCAR fan and you'll hear only positive things about him. Voted as most popular driver for the last six years, Awesome Bill From Dawsonville has become a household name as well-known as Mario Andretti. In the last few years, he has run his own team and has not had the success that many would have hoped. I built this kit several years ago as my first NASCR stocker since I built Bobby Allison's #22 Buick back in 1984. Only this time, I built a T-bird and used aftermarket decals (more on those later). Had I known that this kit was worth so much on the rare kit market (I'd seen it advertised for $95.00! ), I would not have built it. But that was four years ago and I "didn't know better" so I built it. Since then the market has fallen out of plastic NASCAR kits so it is worth about what I paid for it. Basically, it was almost exactly like the Buick, and much like the Nascar kits of today. The big differences were the Ford engine and Thunderbird body. As with the Buick kit I had problems getting the chassis to set straight and level on all its wheels. As a result of that, I have it more or less permanently mounted on a display base so one does not see the fact that it only sits on three wheels! The kit was built straight out of the box with the only difference being the decals. As many of you are aware, the Monogram decals leave a lot to be desired, so I chose JnJ decals of Kyle Petty's 1985 Citgo Thunderbird. Since there was no change in body style from 1984 to 1985, this was a straightforward job. The big problem was determining exactly what scheme to do. Nascar racers are not always painted exactly the same throughout the season or sometimes from race to race. 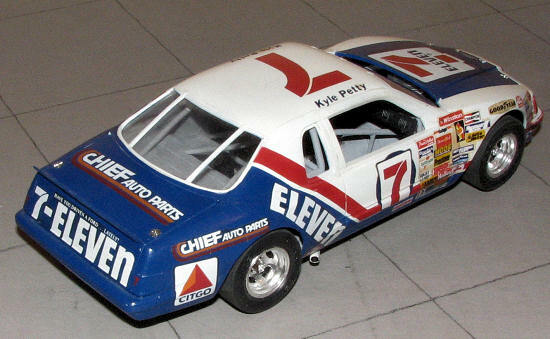 This was the case with Kyle Petty's car. Granted, most of the changes were in decals, but in this case it was also the placement of the red stripes and other red-painted parts. I was looking for the scheme with the red grille and headlights as well as the all-blue hood. Looking at several of the races I had taped back in 1985, I found the scheme I was looking for at the spring race at Darlington. Several stop-actions of pit-stops were all I needed to finalize the scheme I was modeling. As with all kits, the body was first sanded and then primed. The first coat was white and when that was dry, the body was masked for the dark blue and then painted. After that was dry, additional masking was done and the red was painted. The red was the most difficult as it went over several undulations on the body including the very edges of the front bumper, a particularly daunting area that needed several attempts to get right. After all that, the decals were applied. The JnJ decals were admirably opaque and allowed none of the dark blue to show. This was my biggest worry as applying white over a dark color is always a problem. I did have to use the Monogram decals for the front fenders as the myriad of small sponsor decals were not provided in the JnJ sheet. Fortunately, their application was accomplished with little problem. After all of the decals had been applied, it was time for the Future final coat. One other thing needs to be mentioned. The tires for these kits are made of rubber. That is good, but means that they need to have the tread filed to remove the huge mold mark. I used a huge flat file. I have also used a sanding wheel on a motor tool. Both do the job and both make a mess. I like Monogram stockers and have managed to improve with each kit that I build. If you are an airplane person, try a NASCAR stocker. You'll be surprised at how difficult they are to build after years of aircraft. Late note: I added a few more images of this one to the article. As the model has been around since the late 1980s, it has aged a bit and some of the decals have browned (so just what causes that?). Still a favorite since I do build few NASCARS any more. Perhaps I should review a few more from that period.